Hello, hello, hello! 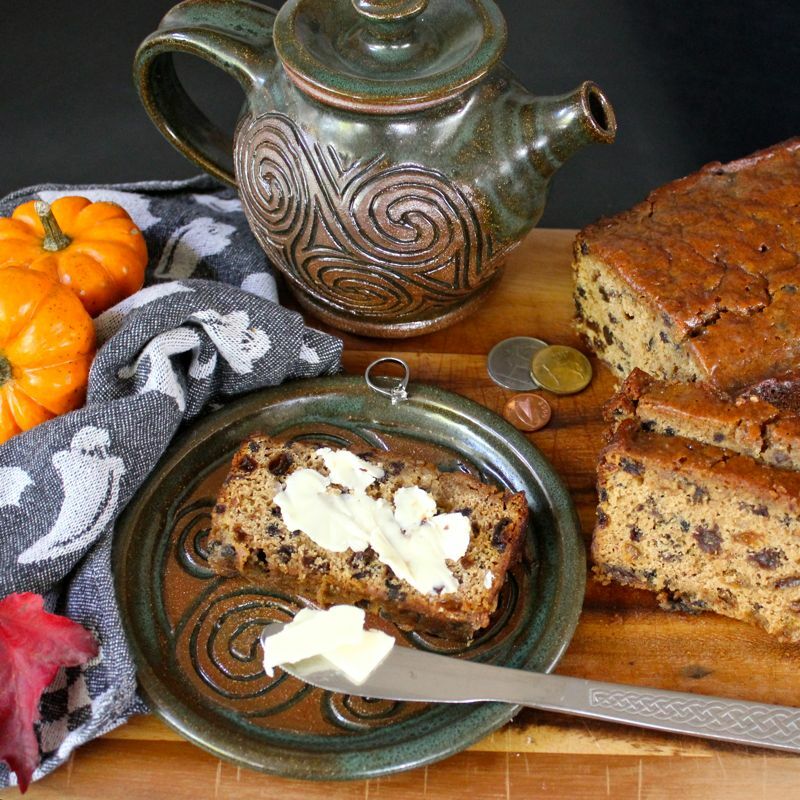 Today is March 1st, which means that starting today I will be posting one Irish-y recipe every day all the way up to the big day…March 17th….St. Patrick’s Day! 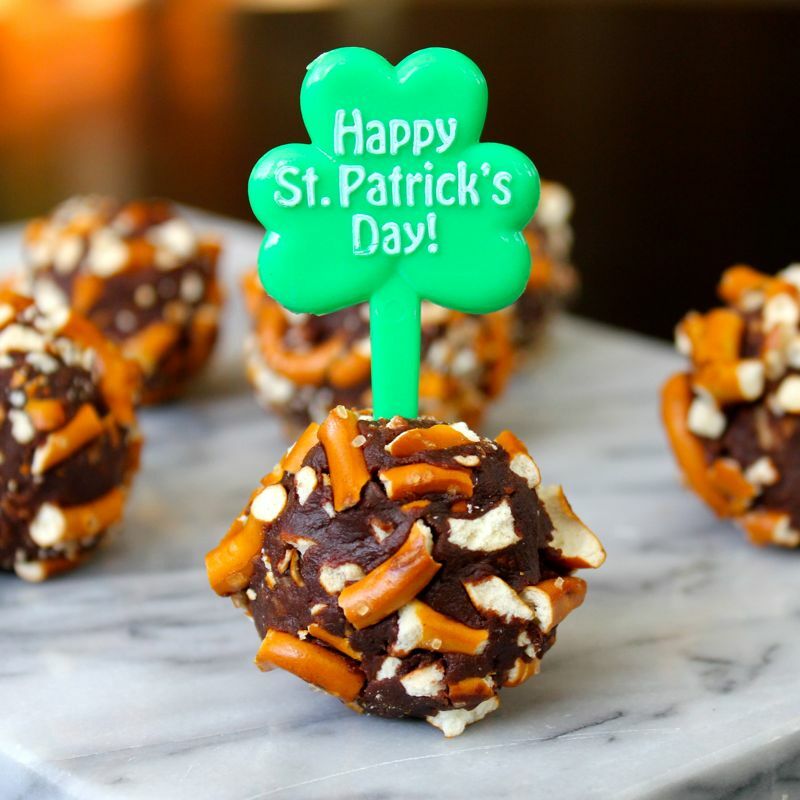 I’ve been inexplicably doing this for a few years now, so I’ve got quite a lot of great St. Patrick’s Day food ideas for you from past years as well. Just click Runcible Eat/Recipes up at the top navigation bar and scroll down to the St. Patrick’s Day category. There are over 50 recipes to choose from there. Not to mention all those that I will be adding this year. Which brings me back to today. 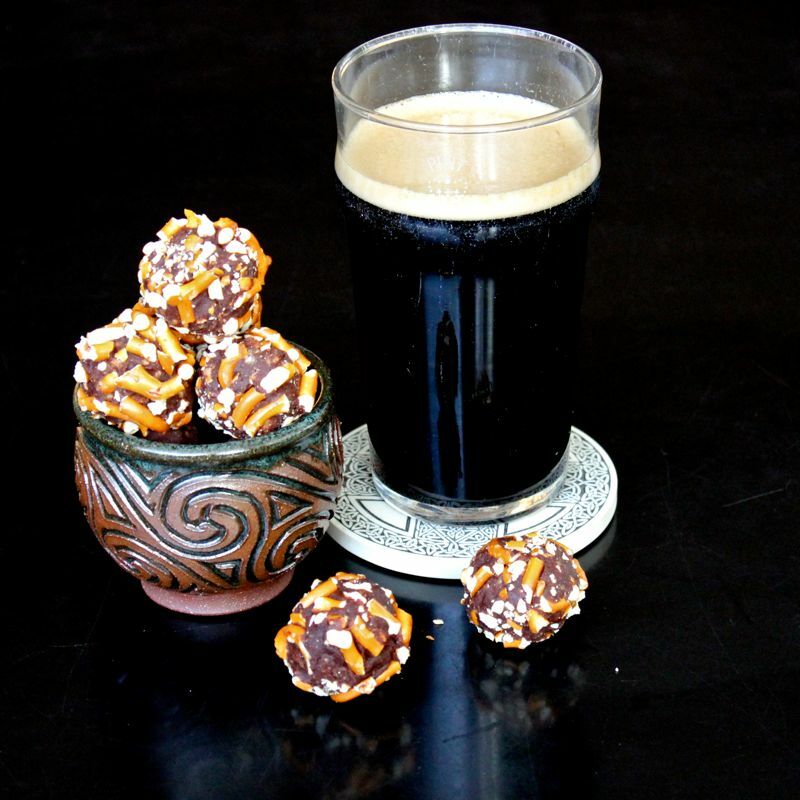 I wanted to start my St. Patrick’s Day blog-a-thon off right and I thought I’d go for something boozy and decadent! 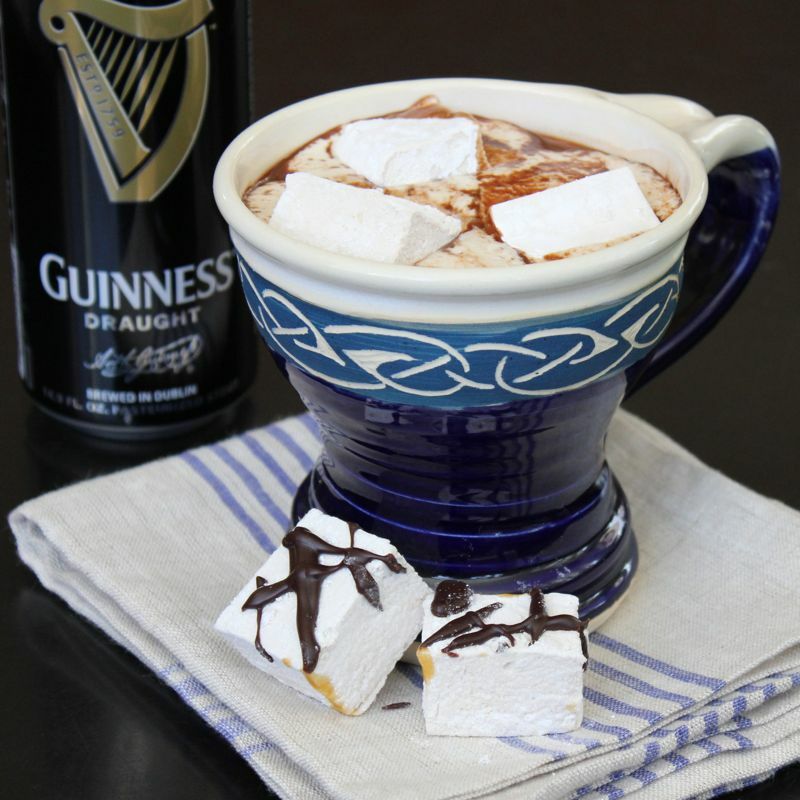 That is just what I’ve got going on here with this Guinness Hot Chocolate topped with Guinness Marshmallows. 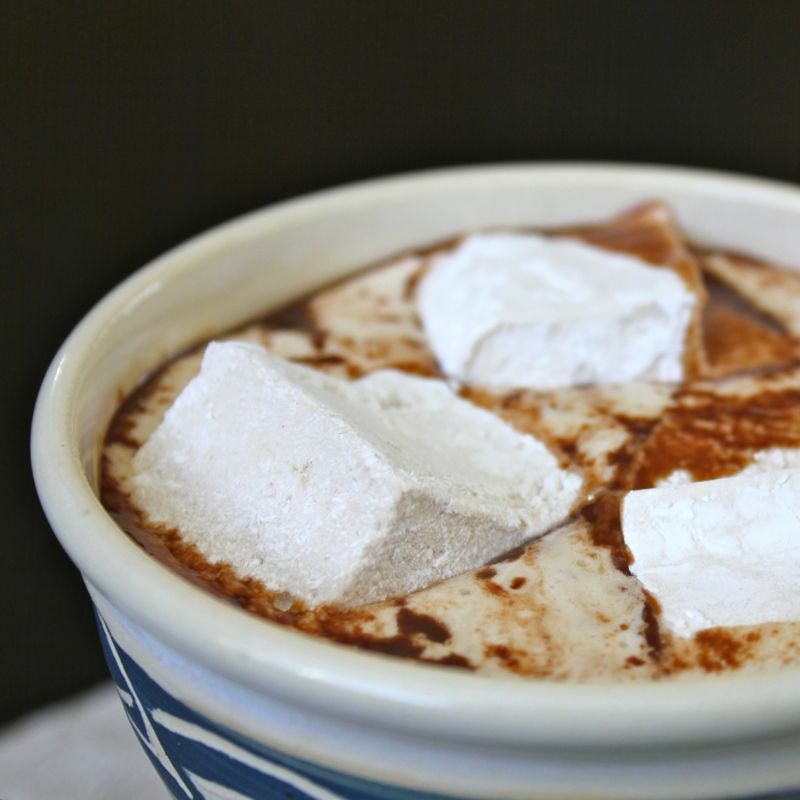 And let me be clear….this is homemade Guinness Hot Chocolate…no powders here…with homemade Guinness Marshmallows bobbing around on top! Whaaaaat?!! 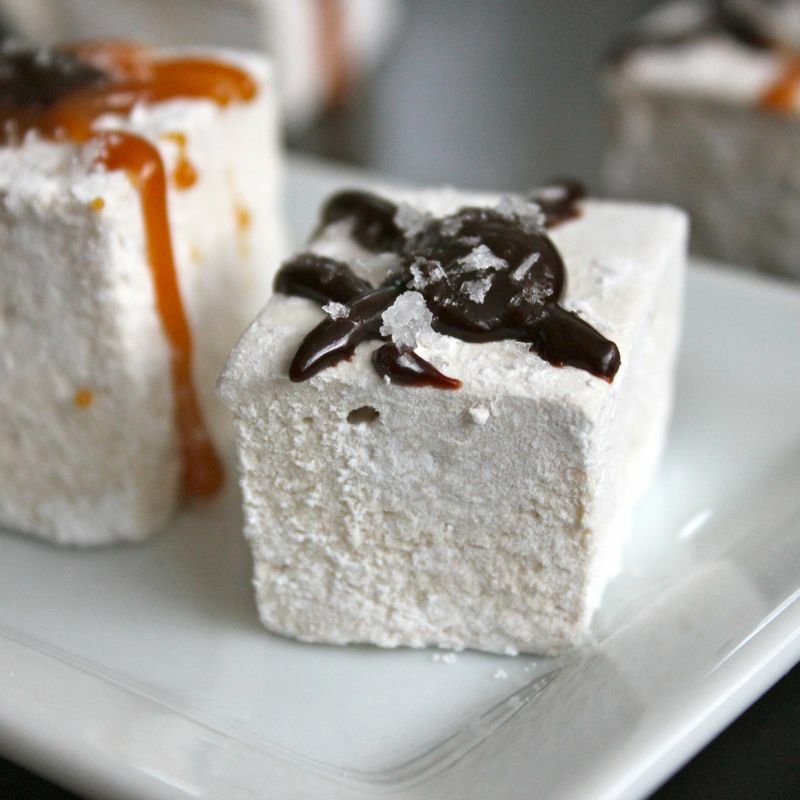 Before I did it, I didn’t know marshmallows could be made at home…well that’s a bit of a fib…I should say I didn’t think I would ever do it. Woooweee! They can and I sure did. And once you taste them, you’ll be spoiled for those little plasticy nuggets that come in bags at your local grocery. You’re kind of getting two recipes today as well. Of course, they can be served together. Gooey Homemade Marshmallows melting on top of a big mug of piping hot silky smooth liquid chocolate and Guinness blend is a no-brainer for sure, especially in light of the lovely weather we have been graced with this winter. 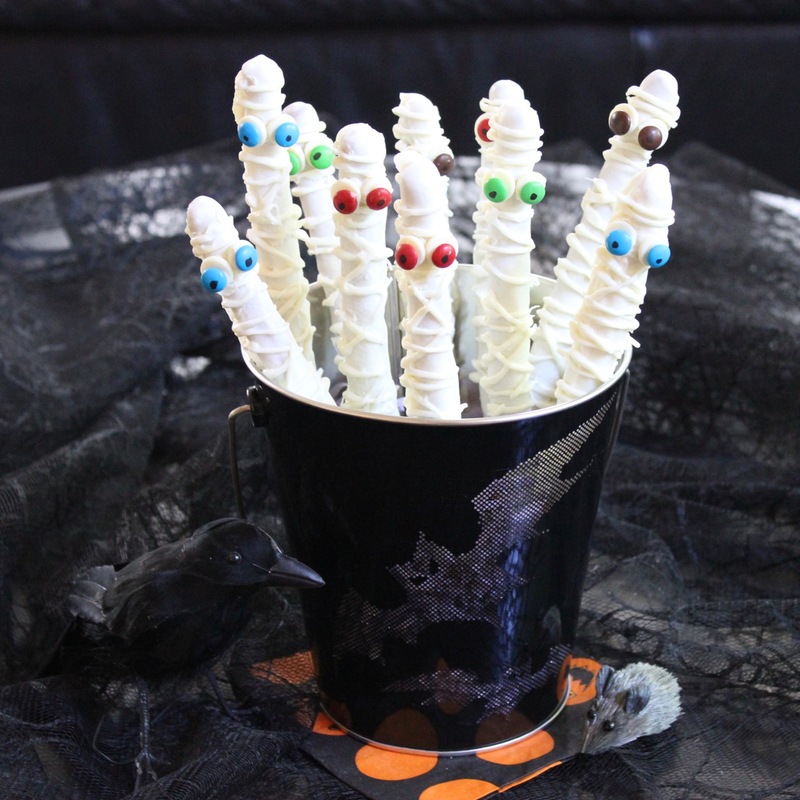 But you can also just serve these marshmallows as a treat all on their own. Once you’ve accessorized them to meet whatever your tastes might be, they simply look divine and taste pretty heavenly as well! I’ve provided you with a couple of toppings options, but really you can add whatever you like. Get creative! 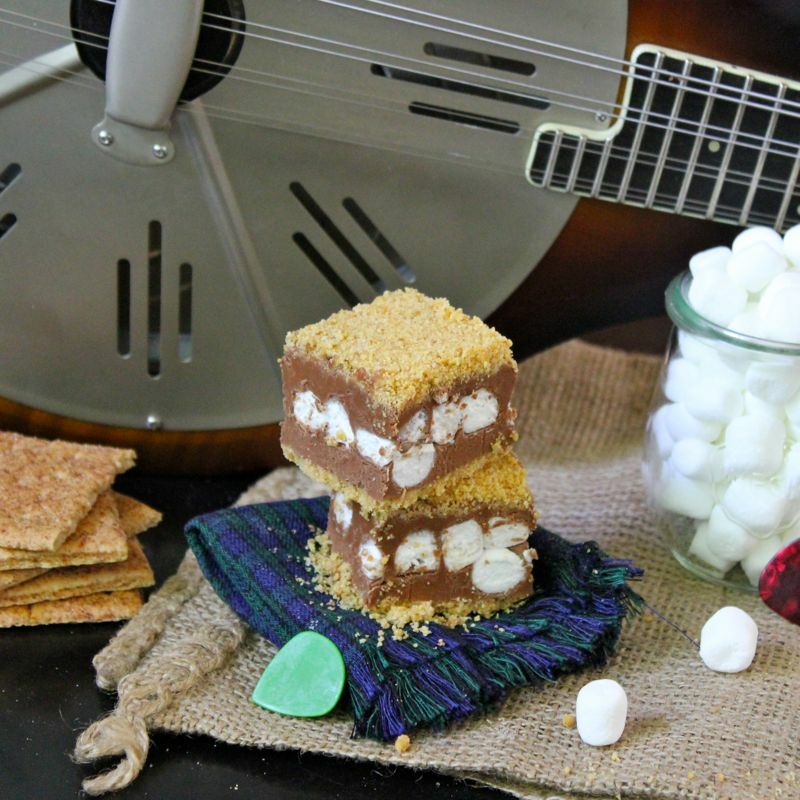 But definitely try your hand at a batch of these Guinness Marshmallows today! But let’s not forget that rich, thick and creamy Guinness Hot Chocolate with all of the Guinness Marshmallow excitement. It will be exactly what the doctor called for to warm you once you’re back inside after the parades. Cold weather simply calls for the comfort of Hot Chocolate and the addition of the Guinness, which adds a bit of a nutty depth of flavour, really ups its game. 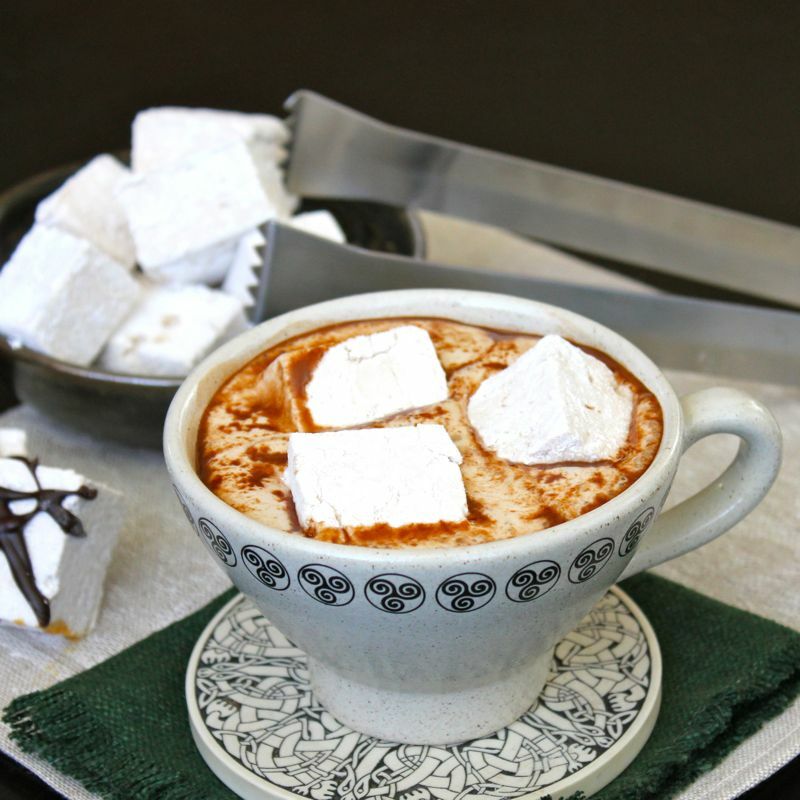 Yup, this Hot Chocolate with an Irish twist is pretty special all on its own, but when you pop a couple of the marshmallows on top, you’ll think you’ve died and gone to heaven! So there you have it…day one of this years St. Patrick’s Day blog-a-polooza done and dusted. Only 16 more to go! Hope you’ll stick around for all the fun! 3-4 tablespoons roasted salted pistachios crushed. Whisk the Guinness to flatten. Or just crack one open and leave it sitting the night before you plan to make the marshmallows. Remove some of the foam if necessary. Lightly oil your 8×8 pan and generously dust with the confectioners sugar and cornstarch mixture. 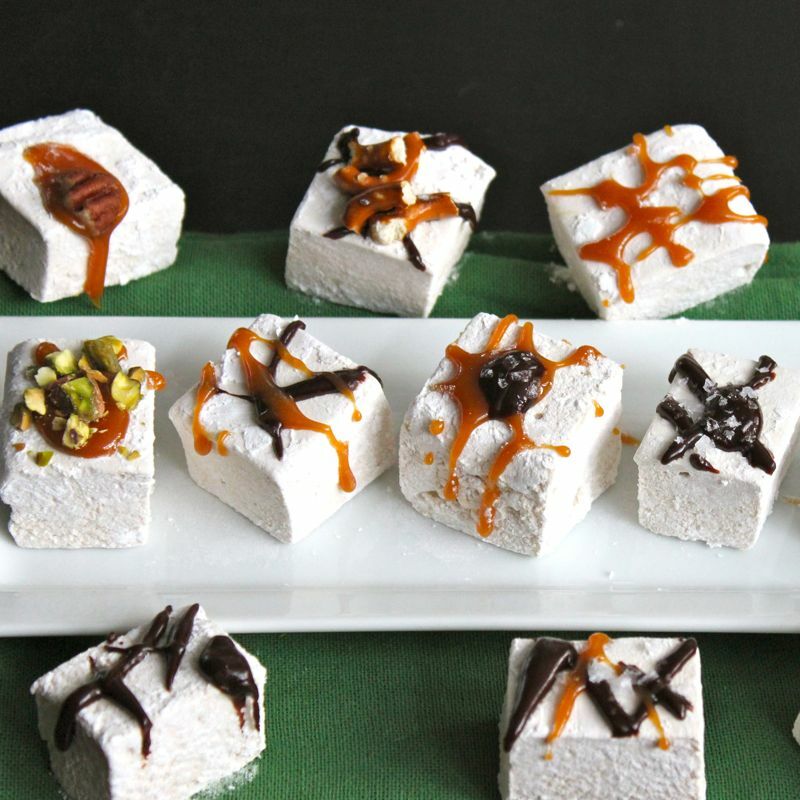 Reserve the rest for use when cutting the marshmallows. Using the mixing bowl of your stand mixer, place ½ cup of Guinness and sprinkle the 3 envelopes of gelatin powder. Leave to bloom. In a separate bowl, whisk your egg whites until stiff peaks set aside. In a medium saucepan (and when I say medium, I mean you want to have sides at least 4″ high – if you’re nervous like me, go for an even deeper pan!) over medium high heat mix the sugar, corn syrup, and the other ½ cup of flat beer until the sugar is dissolved. At this point attach the candy thermometer to your saucepan and bring this sugary mixture to a slow boil until it reaches 240°F/ 116°C . This sticky, lava-like syrup will bubble up and foam like mad before it reaches 240°F. Stay calm! And stay back…it also pops and spits and burns like the dickens if any of that molten stuff lands on you! Remove from heat. Fitted with the whisk, start your stand mixer on the slowest speed. Being very careful, start adding the hot syrup in a low stream to incorporate with the bloomed gelatine. Once you pour in all the syrup, mix for 2 minutes and then proceed to add the egg whites along with the vanilla extract. Mix on high for about 10-12 minutes, until the mixture has double or tripled in size, it turns an off-white color, it has a nice shine to it and it holds stiff peaks. At this point with the help of a spatula (lightly spray the spatula with some nonstick spray), Pour all this fluffy and highly sticky gooey goodness into your greased and powdery pan. Flatten the top and allow the marshmallow to dry for at least 4-6 hours. Overnight is best. The marshmallow should fill springy and soft to the touch. 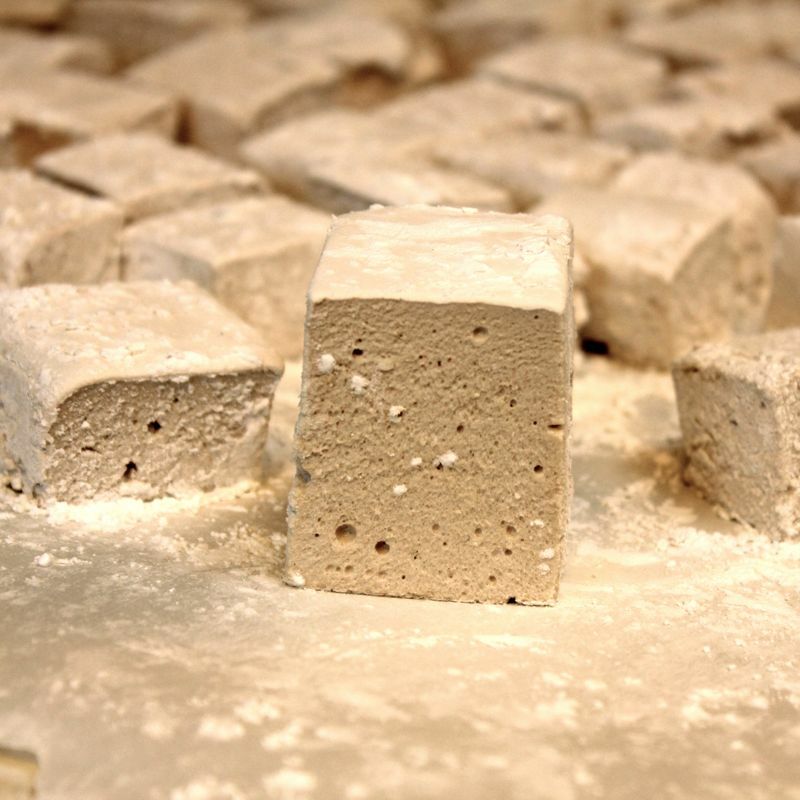 Once dry, over a piece of parchment paper generously dusted with powder sugar and cornstarch mixture, un-mold the marshmallow sheet with a little spatula pulling from one corner and place the big square on top of the paper. 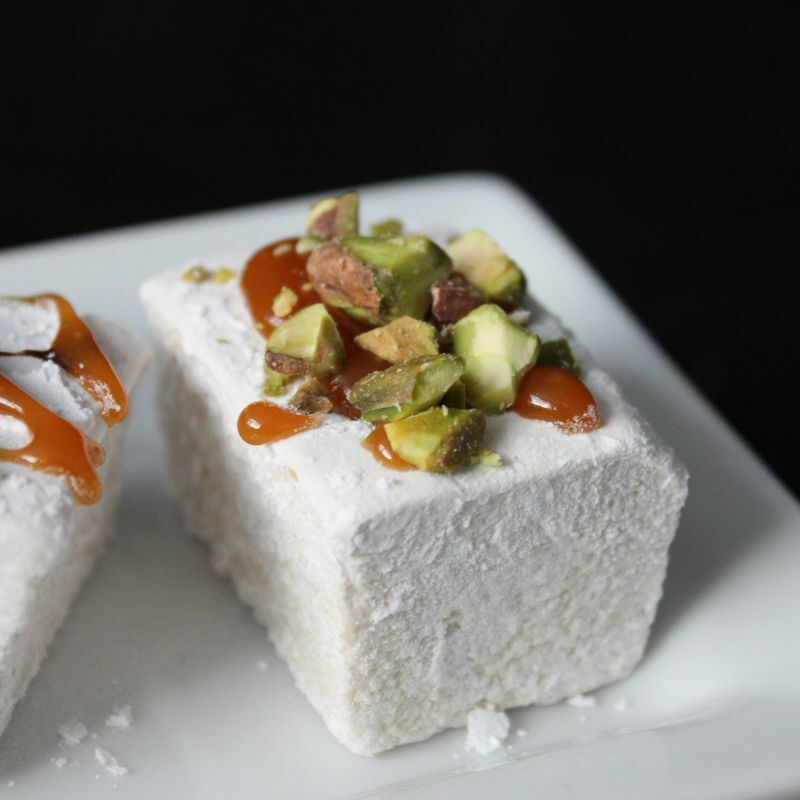 With the help of a dusted knife, pastry cutter, pizza cutter or scissors, cut your marshmallows into squares. Once they are cut, place the remainder of the confectioners sugar and cornstarch mixture in a bowl and toss the squares, so every side is covered with powder to avoid sticking. Shake the excess powder, and place the marshmallows on a clean cookie rack. At this point, you will need to decide how many of these marshmallow are going to be used in hot chocolate and how many will simply be devoured all on their lonesome. The only reason I say this is that I prefer to have non-pretzelfied/pistachio’ed marshmallows on my hot chocolate, but to each his own. Proceed with toppings as you see fit! Melt the dark chocolate, and warm any other sauces you plan to use. 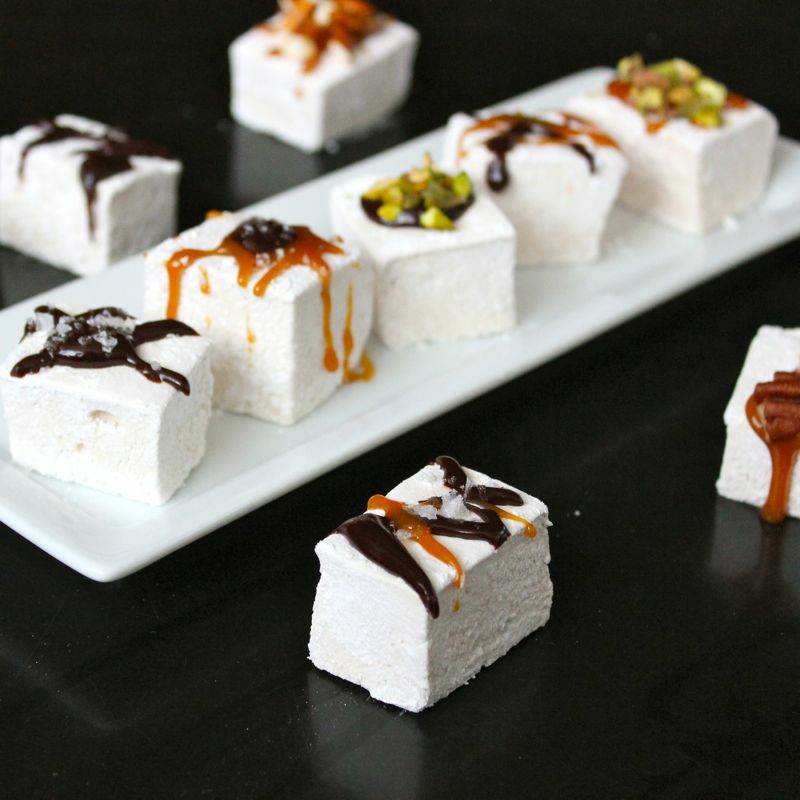 Drizzle the marshmallows, sprinkle with toppings of your choice. In a pan over medium high heat, add the cream, milk and chocolate chips. Stir until melted, about 5 minutes. Remove from heat, stir in the Guinness. Depending on your personal preference, add in the 2 tbs of sugar for a higher level of sweetness. Return to heat and stir until desired temperature is reached (Usually between 140 and 160 degrees F). 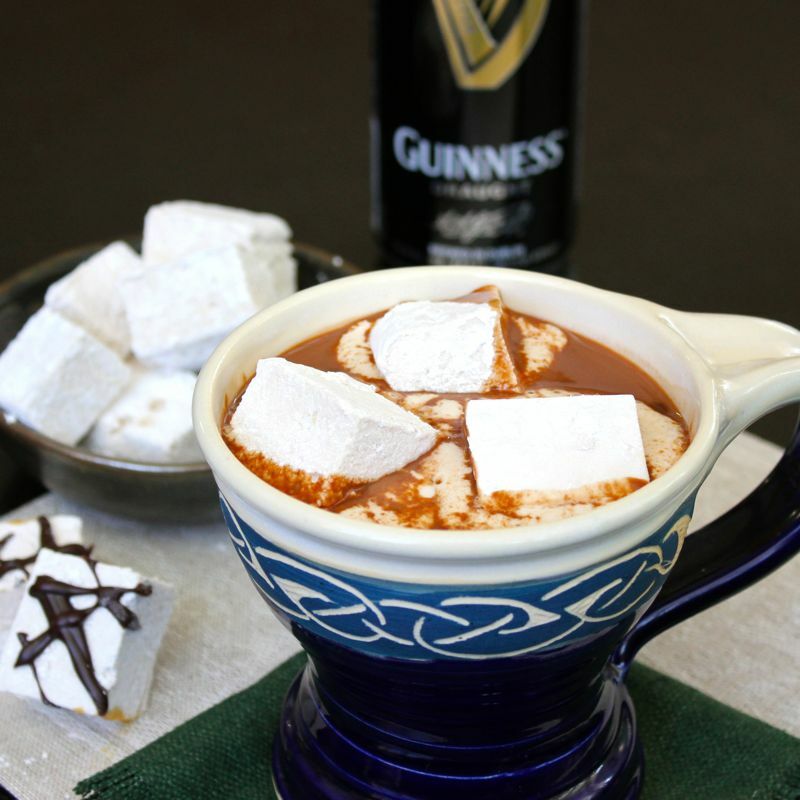 Serve hot chocolate topped with Guinness Marshmallows. 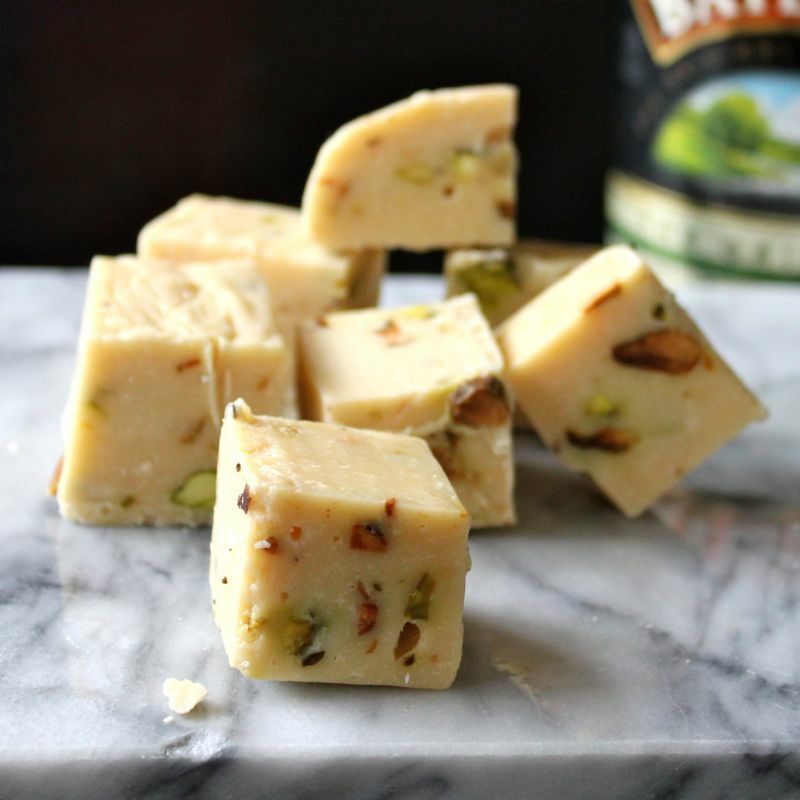 Anyhoo… This fudge was super easy to make and only required me to have the stove top on for 5 minutes and there was nary a bit of oven time need at all. As I’ve mentioned in past blogs, heating up the kitchen one fraction of a degree during these hot swampy Virginia summers is really frowned upon. So no-bake desserts are very popular around here right now. The only thing you might be left wondering at this point is what is the meaning of that “Festy Besty” bit in my recipe title. Well let me explain and also take a moment to plea for a favour. 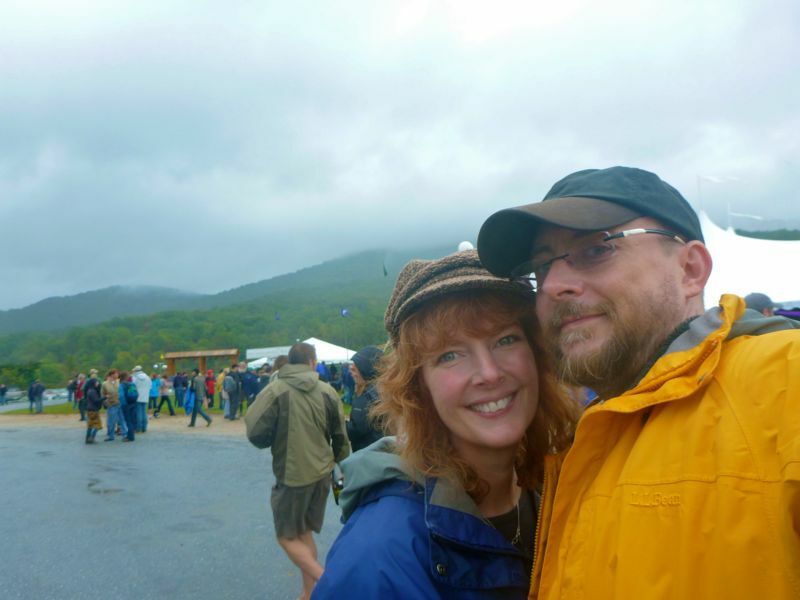 I don’t know if I’ve mentioned it our not, but the husband and I are both musicians. I play mandolin and he plays pretty much anything with strings, but most recently has been seen with a banjo over his shoulder. 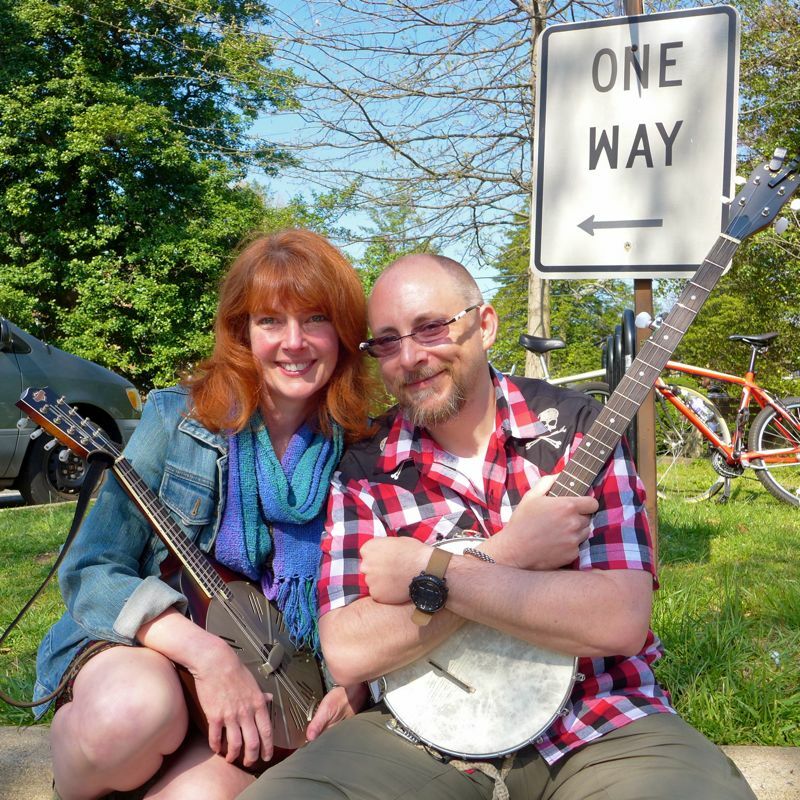 We love to play bluegrass tunes as well as some Old Time and Americana songs. So we are really looking forward to the Festy this year because in addition to hearing all those great acts over the weekend, there are many impromptu jam sessions taking place back at the camp sites and everyone gets to join in. That is where this Festy Fudge comes in. 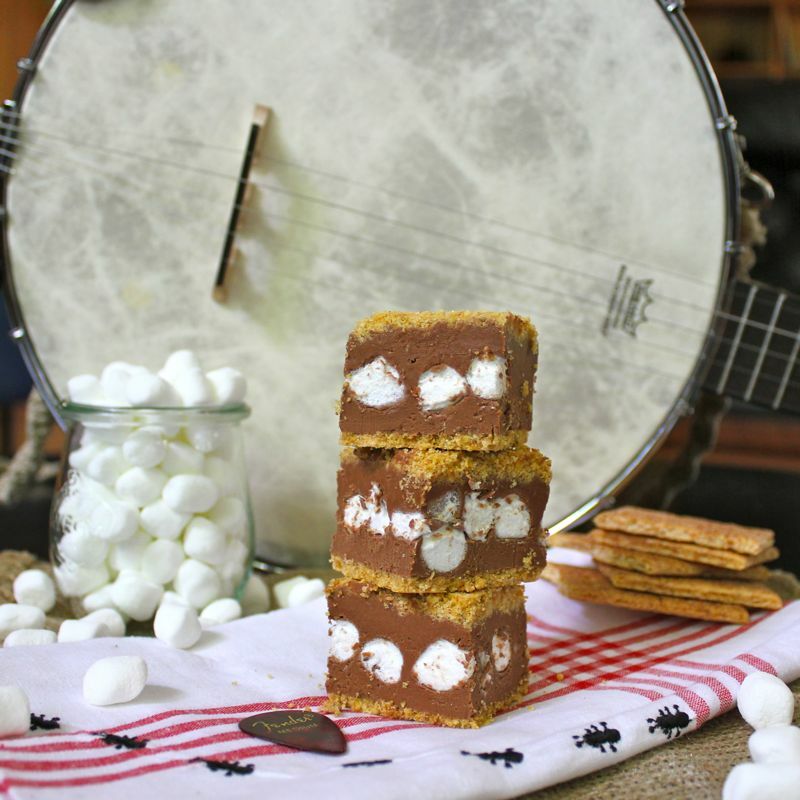 When we are ready to take a break from picking, I will be ready to offer everyone some of that delicious Festy Besty S’mores Fudge. 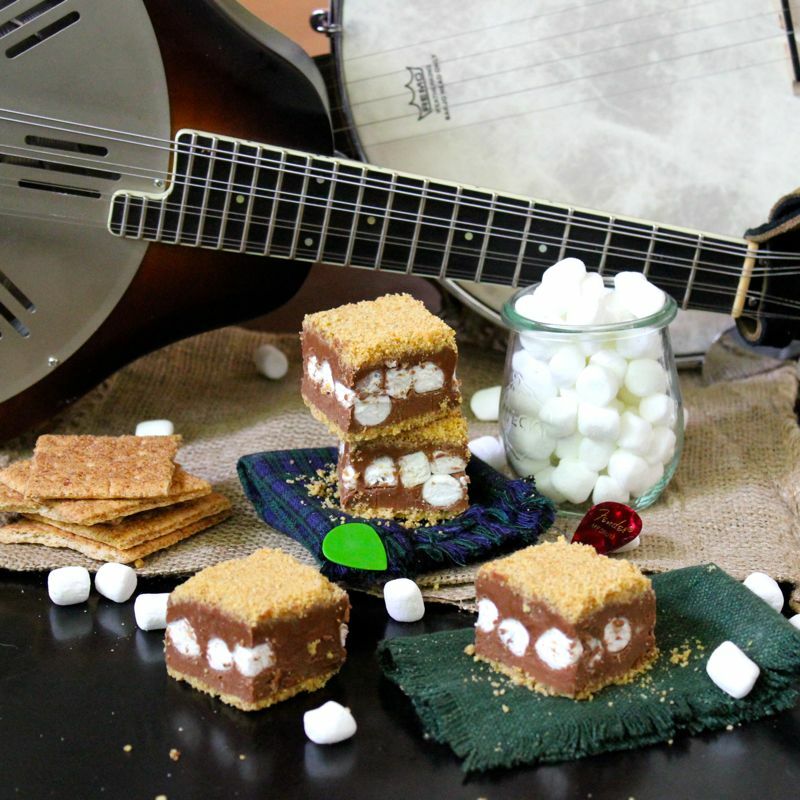 It will be just perfect, enough sugar to keep you going, a little booze to keep you loose and the wonderful campy S’mores vibe to boot. I mean what is camping without s’mores? 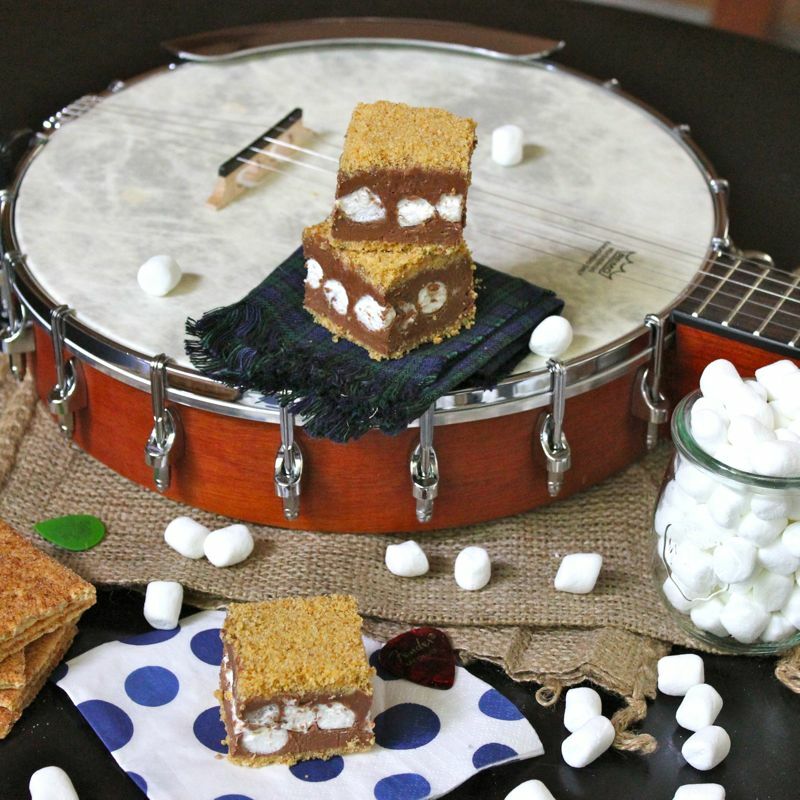 And these little gems are coated with a graham cracker crust which will keep the melted chocolate off of your fingertips, and hopefully off of your strings, when the snacking is done and the playing resumes. The winner gets free weekend camping and back stage passes. Oh my goodness! We would so love to win this. And this is where that favour I mentioned come into play. I’m going to have to ask you for some help. You see the winning photo will be chosen from the photo that gets the most votes. So….Please…pretty, pretty please with S’mores Fudge on top, please take a couple of minutes and cast a vote for our picture at this link: http://thefesty.com/festybesty-finalists-cast-vote-winner/ The deadline for voting is Sunday August 3rd, and thus far, I don’t really have a lot of votes compared to some. Help a girl out ya’ll! 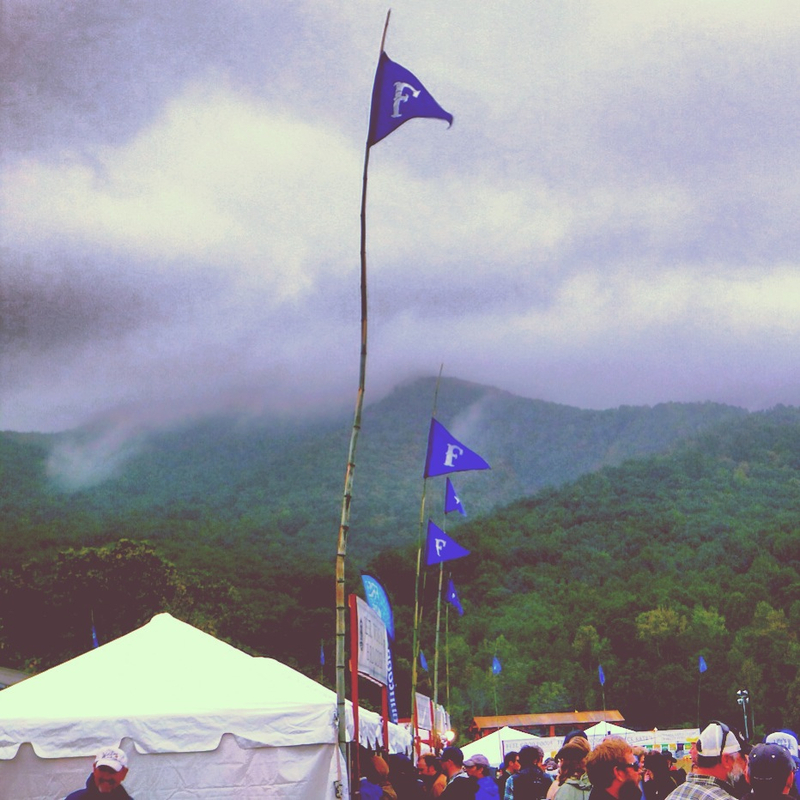 But regardless, even if you don’t do the “vote for people” thing, you should check out the Festy. Tickets are on sale and the lineup looks incredible. You don’t want to miss the raging good times to be had by all! 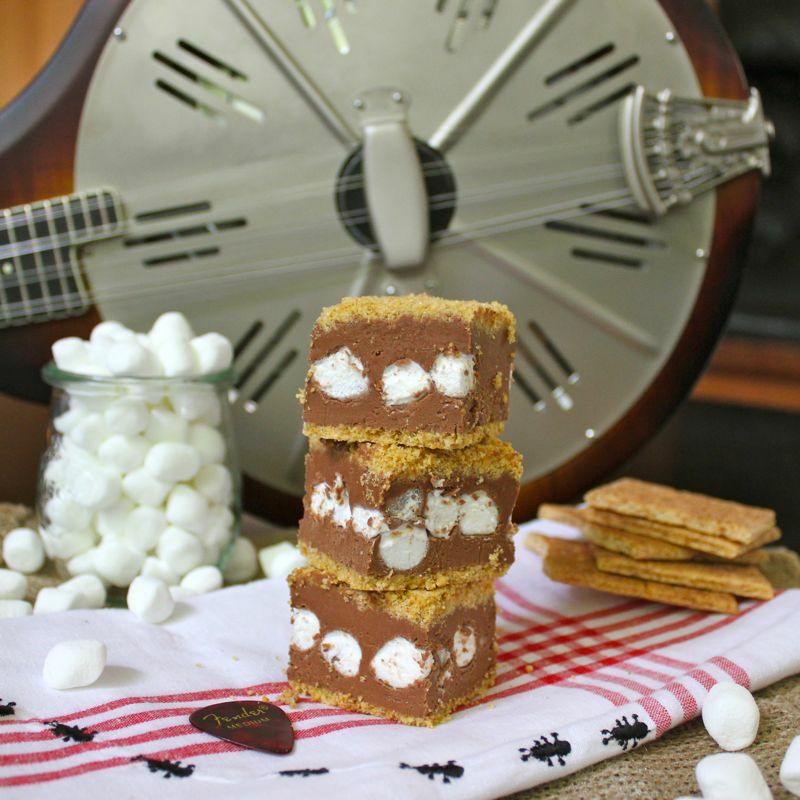 If you are a bit too far away to take part in the Festy, make some of this stunning S’mores Fudge to console yourself. You won’t regret it and keep your fingers crossed for us to win! Prepare the graham cracker crust. Line one 9 X 9″ square pan with aluminum foil. Combine graham cracker crumbs, sugar and melted butter in a medium bowl and stir until well combined. Press half of the graham cracker mixture evenly into the bottom of the pan. Set the remaining graham cracker mixture aside for the moment. Make the Fudge. Add the sugars, butter, heavy cream and salt into a medium-sized , deep pot and bring to a boil Boil for five minutes, stirring occasionally. Remove from heat and using and electric mixer, beat in the marshmallow fluff. Next add the chocolate chips to the mixture and beat until the all of the chocolate has melted and the fudge is smooth. Add the Marshmallow Vodka to the mixture and continue to beat until combined. Pour half of the fudge over the prepared graham cracker crust in the 9 X 9″ pan. Top with the mini marshmallows. 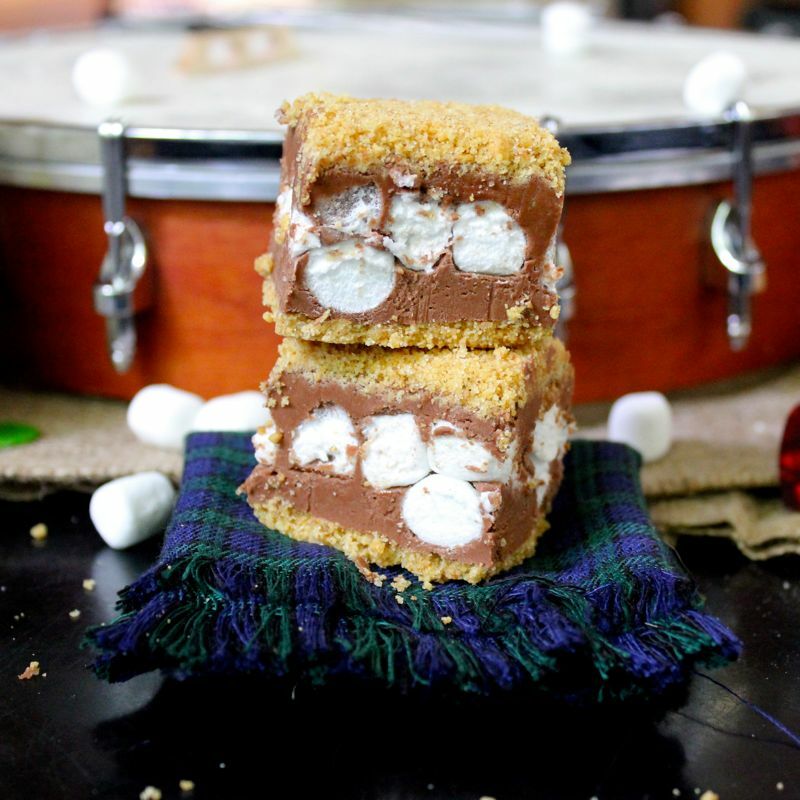 Cover the mini marshmallow layer with the remaining chocolate fudge and smooth the top. Cover the top of the fudge with the remaining graham cracker mixture and press down gently. Cover the pan and place it into the refrigerator to set for at least four hours. Cut into squares and serve. Time for more candy in this St. Patrick’s Day countdown I say! And who doesn’t like truffles? Better yet, who doesn’t like boozy truffles?!! 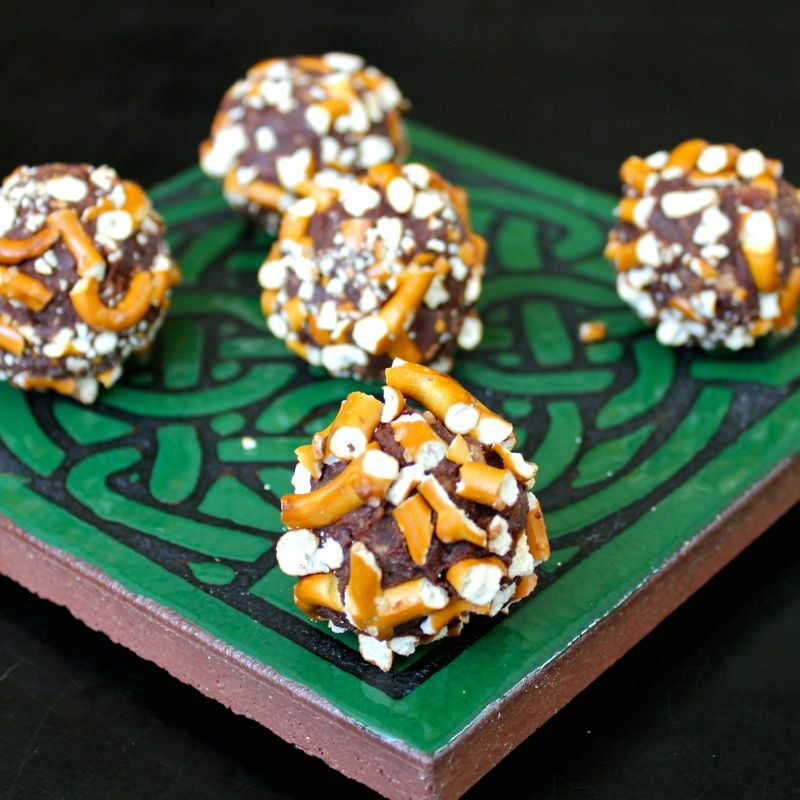 These Guinness Pretzel Truffles will knock your socks off! You know how some truffles are just so tooth-achingly sweet you can’t manage to take more than one nibble? Not these little devils. You see they have a reduced Guinness syrup added to the chocolate. That Guinness reduction adds an earthy, slightly bitter stout flavour to the chocolate and also serves to temper the sweetness. I’m sure that sounds great to those of you with a bit more subdued sweet tooth. But wait…there’s more. 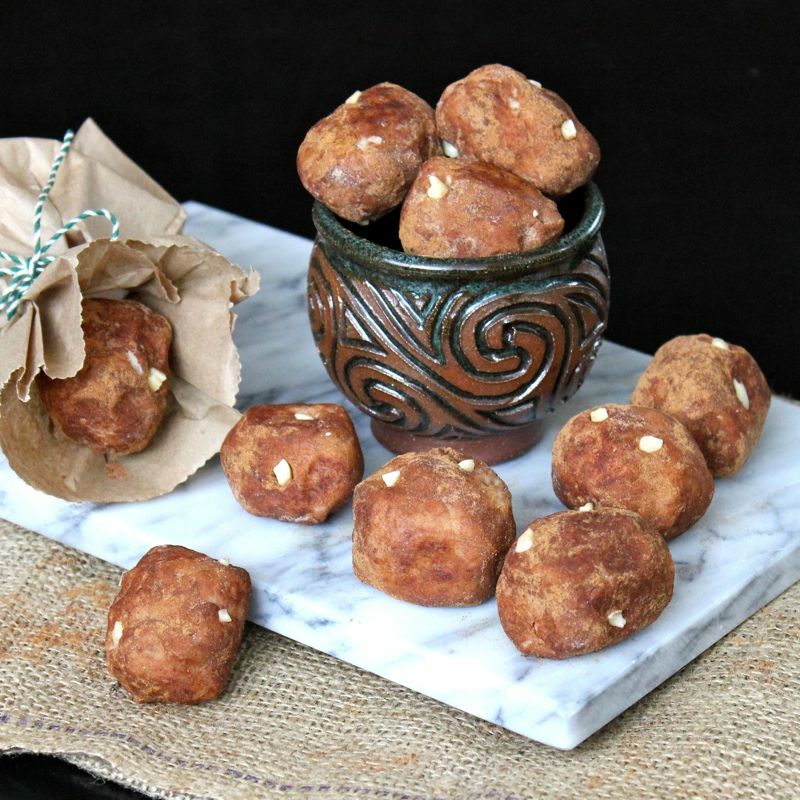 These tasty treats are then rolled in crunchy, salty crushed pretzels. 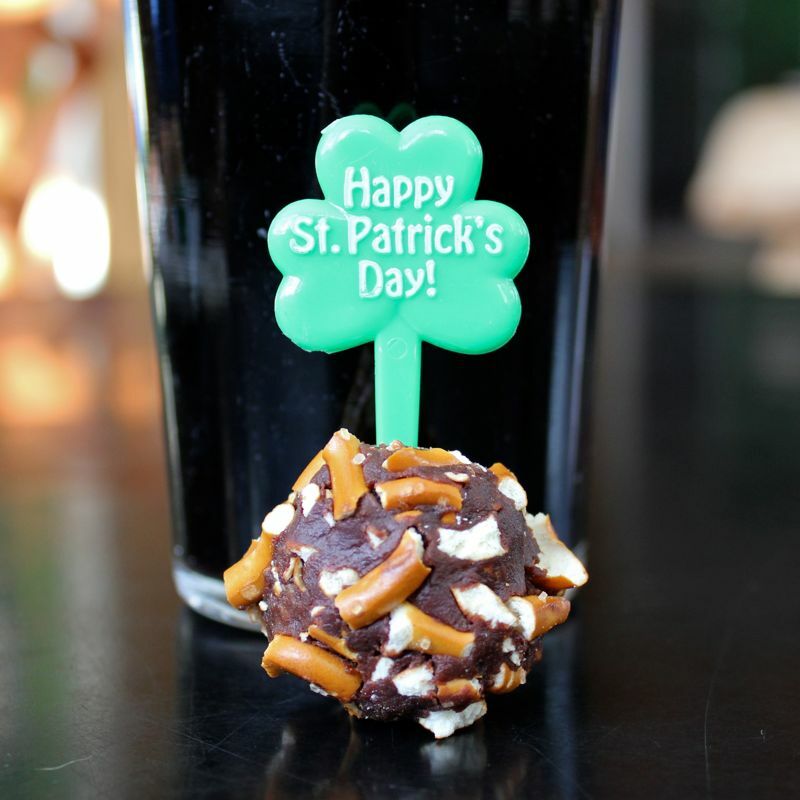 So there you have it – malty Guinness, rich dark chocolate and salty pretzels combined to make an irresistible St. Patrick’s Day confection. You can have a batch done in no time flat. So what are you waiting for?! You’ll absolutely drive folks wild with these! Place 1/4 cup plus 2 tbsp. Guinness Stout in a 2 cup saucepan. Set aside. Pour the remaining Guinness Stout in a separate small saucepan and bring to a simmer. Cook until reduced to 1 tablespoon, about 15- 20 minutes. Be sure to keep an eye on this because it can be tricky. You’ll notice it will foam up quite a bit at first. Don’t let it boil over as it will be quite the sticky mess to clean up! (Not that I have first hand knowledge of that or anything. 🙂 Also, once reduced considerably, the syrup can burn easily. So – don’t get distracted! 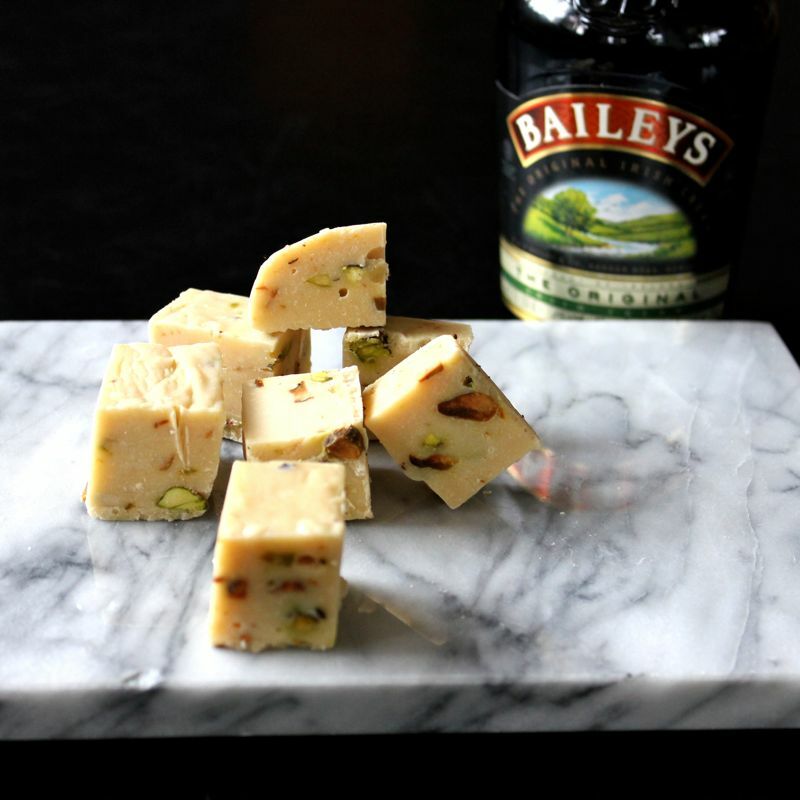 Chop the chocolate into pieces and place in the saucepan with the Guinness Stout. Place the saucepan over medium- low heat and let stand until the chocolate starts to melt. Stir with a wire whisk to blend together the chocolate pieces, but don’t whisk vigorously – we’re not trying to incorporate air. When the chocolate is melted and smooth, begin to add butter 1 tbsp. at a time. Whisk gently until butter is melted, and then add the 1 tbsp. Guinness Stout reduction. Stir in the pulverized pretzels. Pour the chocolate mixture into a bowl and chill in the refrigerator until firm (or overnight). Line a cookie sheet with wax paper. Scoop the Guinness ganache out by the heaping tablespoon and quickly roll between your palms. Once all the chocolate is used up, chill the truffles in an air-tight container in the fridge until ready to roll in crushed pretzels. These chocolates will keep for 7 days when stored properly in the refrigerator. 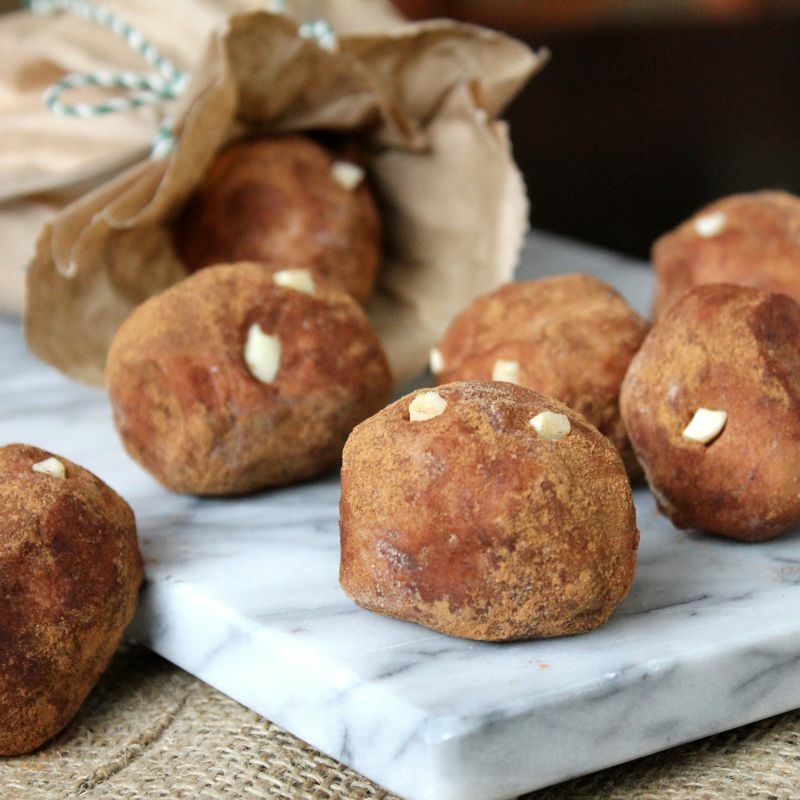 Roll truffles in crushed pretzels just before serving (so they’ll be crunchy!). If crushed pretzels resist sticking to the chilled truffles, roll the truffles between your palms to warm them up, and then roll in the pretzels. The pieces should stick. Only seven more days to go until St. Patrick’s Day! Phew….I can’t believe I’ve made it this far with the daily blogs. Hope folks have been enjoying it. 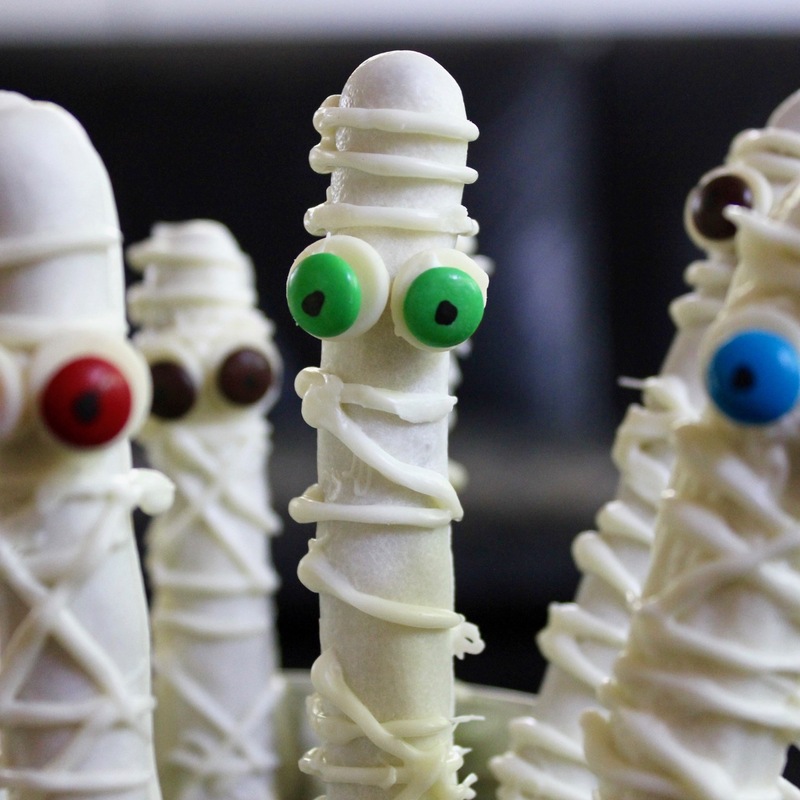 I’ve got a fun, sort of silly recipe for you today. 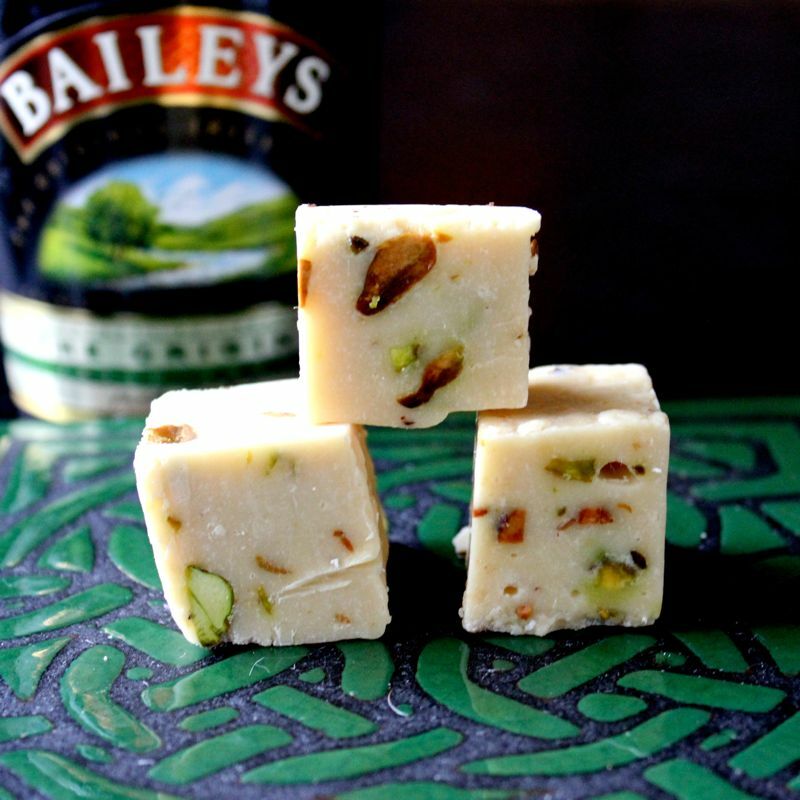 Baileys Irish Potato Candy! Truth be told, no potatoes are actually involved in making these delicious little devils, but they’ve got the look of tiny spuds down huh? What they actually are is a candy made of confectioners sugar, butter, pecans and cream cheese. They get their color from a dusting of cinnamon and cocoa powder and their eyes from slivered almonds. Irish Potato Candy originated in Philadelphia and has been a tradition there for over 100 years. The version you will find there in the “City of Brotherly Love” includes coconut flakes and forgoes the cocoa powder coating, using only cinnamon. I couldn’t resist throwing a bit of chocolate into the mix and while I was at it, I decided a bit of Baileys would go a long way here as well. 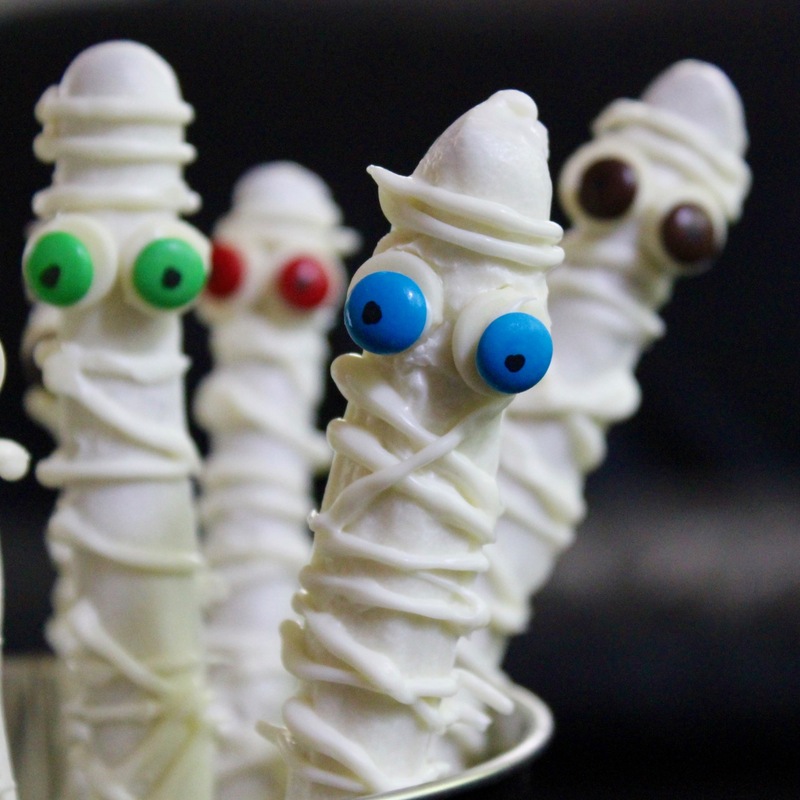 This sweet and creamy candy is very easy to make, no baking involved, just a bit of chill time. I don’t know about you, but believe me, a bit of chill time sounds great right about now! Adorable, tasty spuds… who could ask for more? 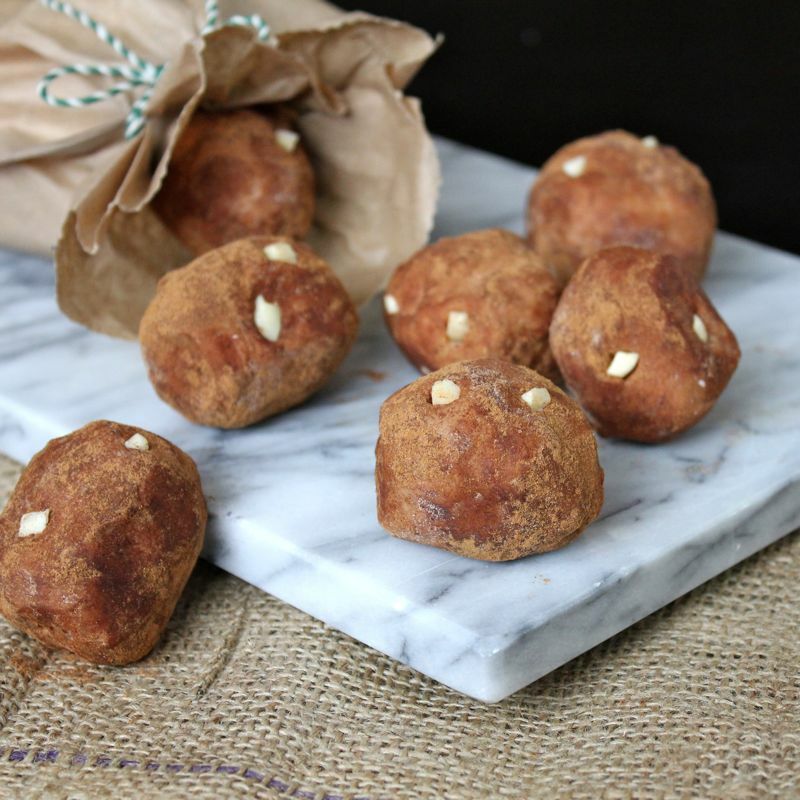 Whip up a sack of these potatoes for your St. Patrick’s Day celebrations today. Beat the butter, cream cheese, vanilla, Baileys and salt until light and fluffy. Place the cinnamon and cocoa in a shallow bowl. Use a 2 tablespoon scoop, and form the dough into small potato shapes. Roll in the cinnamon/cocoa mixture, using a pastry brush to brush off the excess. Today is March 1st. That means St. Patrick’s Day will be here soon! 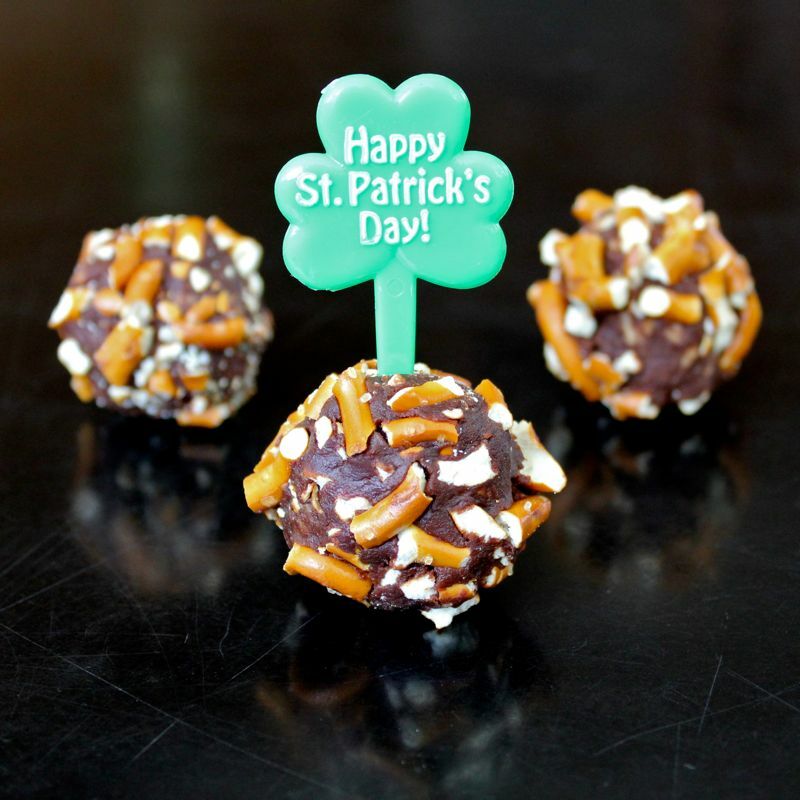 Just like last year, I aim to post one Irish-y, St. Patrick’s Day recipe each day up to March 17th. Wish me the luck of the Irish for this endeavor! To get things rolling, I’d thought I’d start off with a St. Patrick’s Day recipe that is both incredibly easy and incredibly delicious. I’m telling you, you don’t even need a stove for this one, you could just use a microwave. 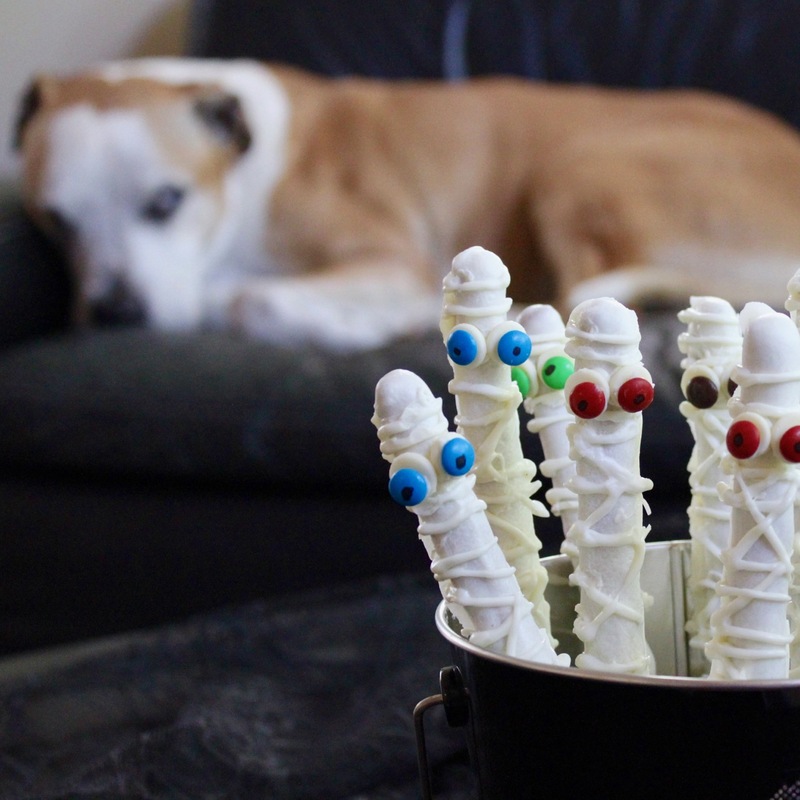 There are no candy thermometers, no baking, just a bit of mixing and a little chill time. Which is great, because it will give you time for a little chill time as well. This fudge tastes so dreamy folks will surely believe you must have slaved over it all day, when you’ve really been kicked back with some sort of refreshing adult beverage! (We are talking St. Patrick’s Day after all :p ). Give this one a whirl, you’ll be glad you did! Line a 9×9 pan with foil and lightly grease with butter (or use nonstick foil); set aside.In a heavy-bottom sauce pan over low heat, combine the first 3 ingredients and stir constantly until the mixture is completely combined. Remove from heat and stir in pistachios. Pour into prepared pan and chill until set. Cut and serve.